I hope you enjoy trying these homemade coffee cake recipes. It's the perfect accompaniment with coffee and there are several flavors offered. Apple nut coffee cake, sour cream coffee cake, poppy seed coffee cake, streusel coffee cake, blueberry coffee cake and so many more below. PREHEAT oven to 350 degrees. Grease a tube pan or two loaf pans. Cream shortening, sugar and vanilla. Add eggs, beating well. Add the dry ingredients with the sour cream. Spread 1/2 of the batter into the prepared pan and add 1/2 of the cinnamon/sugar/butter/nut mixture. Pour remaining batter in and top with the remaining mixture. Bake for 50 minutes. 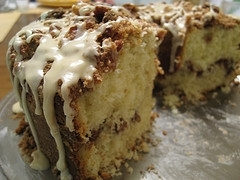 A homemade coffee cake recipe that is a favorite of mine. Add to creamed mixture alternately with 1 cup of sour cream. Fold in 2 cups of finely chopped apples. Spread batter into greased 9x13 inch pan. Combine 1/2 cup chopped nuts, 1/2 cup brown sugar, 1 teaspoon of cinnamon and 2 tablespoons of melted butter. Sprinkle over batter and bake 35 to 40 minutes. This easy homemade coffee cake recipe produces a cake that is so moist - a wonderful morning snack. PREHEAT oven to 350 degrees and grease and flour a tube pan. Alternate 1 layer of batter, 1 layer of filling, etc. Pour into prepared angel food cake pan and bake for 50 minutes. I top it with my cream cheese frosting. If you don't want it to taste like "cream cheese" - just add half of the amount. Beat softened cream cheese with vanilla until creamy and smooth. Then add softened butter a little at time, beating that until smooth. Finally, add whipped cream first and then powdered sugar to taste (I usually don't use the full amount). PREHEAT oven to 350 degrees. Grease tube pan. Soak buttermilk and poppy seeds. Cream the butter and sugar. Add egg yolks, almond and vanilla extract. Sift flour, soda and salt. Add flour mixture alternately with milk and poppy seeds. Fold in stiffly beaten egg whites. Put half of the batter into the prepared pan and sprinkle with half of the sugar/cinnamon mixture. Pour the remaining batter in and top with the remaining sugar/cinnamon mixture. Bake for one hour. 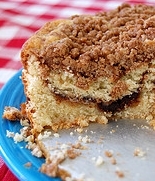 Love this homemade coffee cake recipe. A different twist on the usual coffee cake. Cream shortening and sugar. Beat in egg. Add dry ingredients alternately with milk. Spread in prepared pan. Cover evenly with pie filling. Cut the butter into the topping ingredients and sprinkle over pie filling. Bake 30 to 35 minutes. Serve warm. Love blueberries? This homemade coffee cake recipe is bursting with blueberry flavor. If you do use frozen blueberries do not thaw the berries. Place them on a paper towel to absorb the frost if there is any. Mix them with 1 tablespoon of flour very gently and fold into the batter.